for Alabama’s Distinguished Writer of the Year in 1998, Murray earned his reputation writing about social justice, particularly in the South. An authority on the blues and jazz, Murray often incorporates the cadence of the music into his writing. ASCA presented Murray with its Distinguished Artist Award in 2003. His other awards include the Ivan Sandrof Award for Contribution to American Arts & Letters, National Book Critics Circle, 1996; the Alabama Author Award, Alabama Library Association, 1975, for Train Whistle Guitar; and the Lillian Smith Book Award, Southern Regional Council, 1974, for Train Whistle Guitar. He was inducted into the American Academy of Arts and Letters in 1997. Murray grew up in Magazine Point, outside of Mobile. He left the area for good when he enrolled in Tuskegee Institute as a freshman, but he often wrote about the area in both his fiction and nonfiction, and he readily reminisced about the town that influenced his early work. “Albert Murray is a major intellectual heavyweight,” said John Sledge, former book reviews editor for the Mobile Press-Register. “Mobile in part made him—his education at the Mobile County Training School, his childhood rambles at Magazine Point, the Gasoline Point of his novels." “Albert Murray will be missed in many ways but clearly his spirit will live on through his work and the many stories of those fortunate enough to have shared time with a truly remarkable man,” added Head. 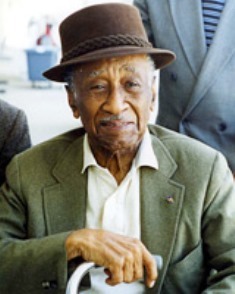 Read more about Albert Murray in The Encyclopedia of Alabama and This Goodly Land.